We were approached by our client, a yachtsman, to design a modern house in a natural river inlet with a very scenic shoreline comprised of houses dispersed within mature trees. The site had obvious appeal as a residential location but gaining planning permission was a challenging prospect as it had an existing industrial use and was within an Environment Agency Flood Plain. 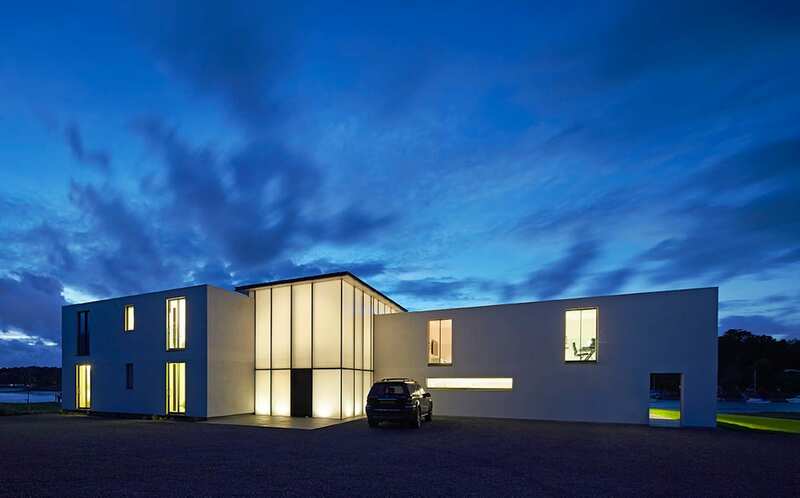 In order to obtain permission, The Manser Practice designed the house as part of a mixed-use scheme with enabling development including a new marina and a series of light industrial units, to help generate economic growth for the area. Our skill in demonstrating the economic, social, cultural and environmental benefits of the project to the local authority was sufficient for them to set aside Environment Agency concerns about potential flooding under PPS25 and grant a permission which would not usually be consented in a flood plain. The house sits on the foundations of a redundant industrial unit and has been raised by 2.5m in some instances to combat the flood risk. In plan it is split into a very transparent living wing, maximising views out to the Solent, and a more solid bedroom wing accessed through a translucent atrium space. It is designed to accommodate arrival by a range of boats, with a small palette of materials used simply and with consistent and coherent detailing. Our design has transformed a redundant industrial site into a beautiful waterside home, and was a winner at the British Homes Awards in 2014.